Note You can send a schedule note if you're using Outlook or any other 32-bit MAPIbased e-mail program. • Send information about critical tasks to the assigned resources. • Send information about tasks leading up to a major milestone to the assigned resources. a • Ask assigned resources about progress on late tasks. ® • Ask assigned resources to report on the status of current tasks. • Alert contacts in human resources, procurement, or accounting about their responsibilities related to a set of resources. • Report current status of selected tasks to a managing stakeholder. In Microsoft Project, open the project file that contains the information you want to send. Display the view, including the table and fields, you want to send. Select the tasks or resources whose information you want to send. Click File, Send To, Mail Recipient (As Schedule Note). The Send Schedule Note dialog box appears (see Figure 18-7). Figure 18-7. You can transmit a selected update with a Schedule Note. Under Address Message To, select the Resources check box. The e-mail addresses for resources must be identified. This can be done by adding the Email Address field to the Resource Sheet or by entering it in the Resource Information dialog box. If you are using the Contacts field in a task view to include the e-mail addresses of stakeholders or other individuals associated with tasks, you can also select the Contacts check box to send a schedule note to them. Under Attach, be sure that the Picture Of Selected Tasks check box is selected. If you also want to send the entire project file, select the File check box. Click OK. Depending on the settings in your e-mail program or virus protection program, you might see a message specifying that an outside program is attempting to access your email addresses (see Figure 18-8). Specify that you do want to allow this. You might see this message for each recipient of your schedule note. Figure 18-8. Your e-mail security settings or virus protection program might present an alert. Your MAPI e-mail application is launched, if necessary. 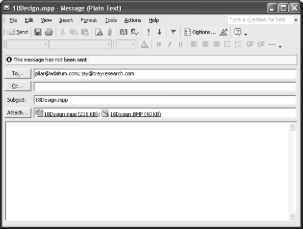 The new e-mail message form appears with address information filled in and the title bar reflecting the name of the project file. The specified attachment is included. If you are sending a picture of selected tasks or resources, a .bmp file is attached. If you are sending the entire project file, an .mpp file is attached (see Figure 18-9). Figure 18-9. A new e-mail message is created with the recipients and attachments you specified. 8 In the To and Cc boxes, add any additional recipients as necessary. 9 In the Subject box, enter a subject. 10 In the message area, type a message to inform your recipients of your intentions with the project attachments. If your schedule note consists of a picture of selected tasks or resources, recipients can double-click the .bmp attachment to open it (see Figure 18-10). Figure 18-10. The schedule note sends a picture of selected tasks or resources via e-mail. If your schedule note consists of the project file, recipients can double-click the .mpp attachment to open the project file in Microsoft Project, as long as they have it installed on their computer. It would be nice to be able to e-mail a report like the To-Do List to team members or a report like the Project Summary to your boss. But that capability is not available, for many of the same reasons that you can't save a report from a moment in time. 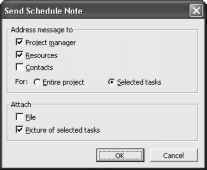 Suppose that you're using the Send Schedule Note dialog box to send a project file, but only a few of the tasks or resources are showing up in the e-mail attachment. When you select the Entire Project option in the Address Message To section, this refers to the recipients associated with the entire project. This does not indicate that the entire project is being sent. Check the setting under Attached. By default, the Picture Of Selected Tasks check box is selected. If you want to send the entire project, select the File check box.